Even with the word "real" in the title, there are plenty of unrealistic aspects to the Real Housewives franchise. As much as these women try to keep it real, their reality will never match my own or any other average person's. I watch these shows because the ladies live lives that I could never have, and this carries through to their relationships with each other. Sometimes I really identify with the women's story lines and perspectives, but there are other instances where I could never picture these things happening in my own life. There are so many differences between Real Housewives friendships and real life friendships that it astounds me. I cannot imagine anyone that I actually know behaving the way the Housewives often do. For instance, I've never seen two women in real life argue with the aid of props, yet that has happened on the show. I've never heard of a real life person writing up and signing a friendship contract, but it was a major story line. I also could never imagine losing a friendship over someone giving another person "the evil eye," yet this was the root of some major controversy. Here are some of the major differences between the Real Housewives friendships and real life friends. When I ask my friends to hang out, I invite them to lunch or to the movies. I don't ask them to be a part of my music video as a casual plan for the day like LuAnn did on Real Housewives of New York City. When I meet a new person, we make it a friendship by hanging out a few times or connecting on social media. I've never written out a friendship contract for another person to sign like Cynthia Bailey did with NeNe Leakes on Real Housewives of Atlanta. And how did she end that friendship? By burning up the written agreement. There is nothing typical about that. When I go to dinner with friends, the only thing we disagree with is how much to tip the waitress and how to split the check. Whenever the Real Housewives go to dinner there is almost always a major argument, curse words flying around, and glasses being thrown. There is no such thing as a casual dinner with any of these women. When a friend talks trash in real life, normal people just stop talking to the person or send out a subtweet. In Real Housewives of Orange County, Tamra Judge had a lawyer write up a cease-and-desist letter to Jeana Keough because she kept talking to the media about Tamra's divorce. If one of my friends ever called me a nasty name, I would be done, but I don't have any contractual obligations to film a reality show with my friends. 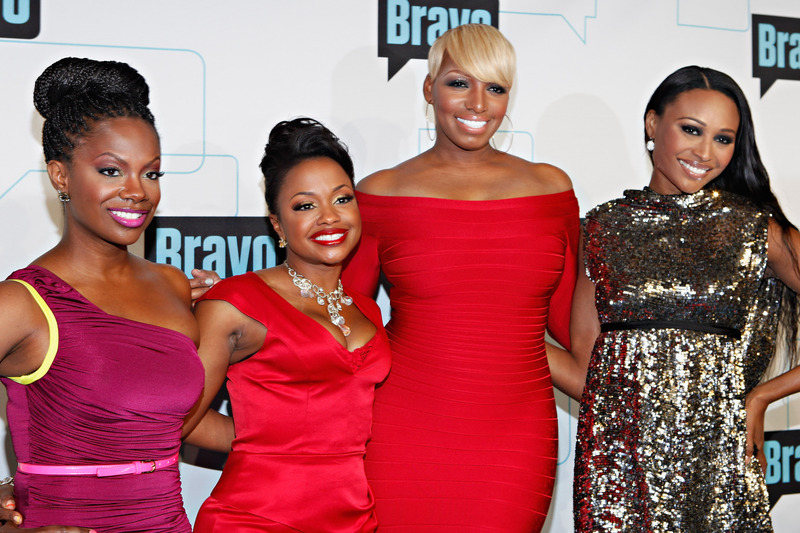 When Phaedra said she hadn't called Kenya a whore in a year on RHOA, it was such a weird defense. Is there a statute of limitations on name calling in reality television that isn't applied in real life? I've never seen anyone bring props to a discussion in real life, but Kenya thought it was totally normal to bring a wand to the RHOA reunion and point it in Porsha's face. No average person would ever do this. No one actually ends friendships over someone giving another person the "evil eye," but this was a major sore spot for the women on Real Housewives of Orange County more than one time. Out of all the offensive things these women have said and done to each other, how is a questionable glance the one that has done the most damage to their relationships? When average people get in a fight, they don't try to assert their status by telling a frenemy to Google search them. But the Real Housewives think the world revolves around them and that they are all stars, so it's not shocking for them to throw around their "fame" in an altercation. Sometimes I wish I was a Real Housewife, but when I see these strange friendship interactions, I would rather not be a part of it.